With recent changes to Bill C-45, it places legal accountability on Managers (can be sued personally and company may not be able to help defend). If you manage/lead others in projects, no matter what type of industry, the team will face safety hazards. So ensure you cover this (see below) and create a safety culture. Changes occurred several years ago to put more responsibility and accountability to managers. Each provincial government has its own occupational health and safety (OH&S) act and regulations. Within SK there is the OH&S Act 1996 and OC&S regulations 1996. OH&S laws are regulatory in nature to encourage compliance and deter non-compliance (vs. punitive in nature). With any work place accident or incident, provincial labour representatives have authority to investigate the accident with potential to recommend charges. This is also the case with the police, who have the authority to investigate the accident with potential to lay charges. Criminal code charges may fall under Bill C-45 (which has also been referred to as the “Westray Bill”. In 1992 the Westray mine had a disaster (after repeated warnings and disregard to safety by management) where 26 people lost their lives. No one was convicted in association with the disaster. Bill C-45 makes it easier to convict an organization and criminally prosecute management personnel of the organization. Section 217 is summarized as: everyone who undertakes or has the authority to direct how another person does work or performs a task is under legal duty to take reasonable steps to prevent bodily harm to that person or any other person, arising from that work or task. taking reasonable steps to ensure the effective operation of the system. This has elements of subjectivity so a general rule of thumb is to do as much planning in advance as possible, avoid last minute plans or environments that are not conducive to good planning. ensuring you and your workers follow a site/company OH&S program and set of procedures. Other examples could include: appropriate PPE, safety meetings, proper supervision, adequate training, work permit system, an emergency response plan, accident investigation system, inspection process, preventative maintenance process, hazard/controls system, quality management system, and good document management. Safety hazard analysis – these are systematic reviews of the processes of the job at hand. Each job that has potential hazard to personnel, general public or any person that comes on site (suppliers, transport, guests, etc). In association with the hazards (also known as risk) should be an adequate level of controls put in place. The risks must be lowered to a manageable level (by use of controls) before the job is started. Incentives – another way to ensure the contractors are focused on safety is to align financial compensation with objective measurements and results of safety. Examples include bonuses for levels of time without safety incident, and levels of time without lost time due to safety incidents, etc. Often the incentives do not have to be monetary but can be merchandise, gift certificates, etc. If utilizing this approach, it must be ensured there is an effective and open system to report all incidents that occur (incidents are not covered up or ignored). The one true goal of every manager of every industry is to focus on a Safety Culture. We all want this, so ensure the team understands and is embracing it. Scope, Time, Cost used to be the big 3. Then Quality and Communication joined the priority list. Now it seems the only true priority knowledge area that takes priority in management Risk. Business and Project Management is all about risk. As humans, we take risk every day in personal and work life. Our ability to learn, grow and advance in how we deliver work is constantly evolving. It is common now for all roles (front line to exec) within an organization to have training about the basics of business and project management. We live in a highly interconnected, collaborative world and it is the future. This is the path to true success and we are rapidly getting better at this. We are getting to a point where we all generally understand the steps how to properly deliver work but we still have challenges dealing with uncertainty and mis-aligned expectations. There is so much info at our finger tips related to methods, systems and tools how to get work done. However, there is still a shortage of tools that deal with unknowns and the abstract (and humans are not comfortable in that zone). Risk is where things may or may not happen, how we manage that and be proactive as possible, is the essence of risk management. This will be the next knowledge area that has large gaps and opportunities to pursue in terms of achieving success. A good sample of a Risk Wheel which is general enough to use for all types of projects and roles and help them be on the same page of understanding, is included below. Included below is an example of a risk monitoring and controlling process (please reference the Software Engineering Institute, for further details). The process is represented as a circle to emphasize that risk management is a continuous process that will evolve throughout the project life cycle. Communication is placed in the center of the circle because it is both the conduit through which all information flows and is also considered the most influential risk activity. · Identify - Before risks can be managed, they must be identified and logged (e.g. logged into the Issues and Actions Log). Identification helps to prevent risks from becoming problems and adversely affecting a project. Project managers must continually urge the project personnel to raise questions, concerns and issues for subsequent analysis. Meetings should be held on a regular basis, (frequency dependant on complexity and duration of project), in order to facilitate the identification of risks. An effective way to identify risk is to identify the process, break down the process into steps and associate each step with the level of risk. Note: when risk identification occurs, the pre-control level and the post-control level should be identified. · Plan – response planning transforms risk information into risk management decisions and actions (both present and future). Planning involves developing actions to address individual risks, prioritizing risk actions, and creating an integrated risk management plan and responding to the risk by acting on the plan. Study the risk further to acquire more information and better determine the characteristics of the risk to enable decision making. The key to risk action planning is to consider future consequences of a decision that is made today. 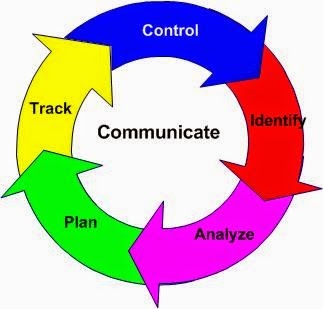 · Communicate - Risk communication lies at the center of the model to emphasize both its pervasiveness and its vital importance. Without effective communication, no risk management approach can be viable. While communication facilitates interaction among the elements of the model, there are higher level communications to consider as well.